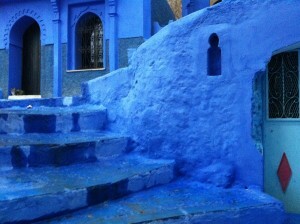 Chefchaouen lies inland from Tangier and Tetouan. Chefchaouen is a unique Moroccan city known for its blue and white washed medina walls that surround it. Filled with old world charm, a walk through Chefchaouen’s blue alleys evokes being in a magical story book, similar to Aladdin and the magic lamp from One Thousand and One Nights. An early morning stroll through Chefchaouen’s winding streets is a great to discover this Riffian town famous for fresh goat cheese, local crafts and peaceful setting. Chefchaouen was originally a small fortress town founded by Moulay Ali Ben Moussa Ben Rached El Alami to resist the Portuguese expansion in Morocco. Built up by Jewish and Muslim occupants in 1471 Chefchaouen served as a refuge for those who fled Andalusia following the Reconquista led by the Catholic King Ferdinand and Queen Isabella. When Spanish troops occupied Chefchaouen, or Chaouen,as the locals call it, in 1920 as part of the Spanish Protectorate in the north of Morocco, they found the population still speaking an archaic form of Catalan which they had brought with them centuries before. 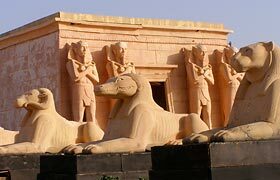 It was a closed city to Europeans until 1920 and was only visited in disguise at the risk of a european’s life. Charles de Foucauld and Walter Harris were amongst only 3 foreign visitors. 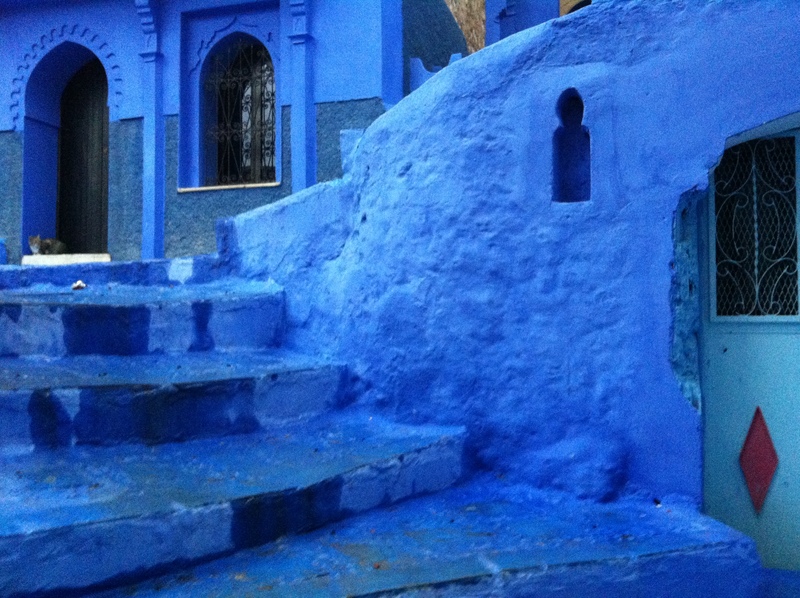 Chefchaouen was returned to Morocco on its achieving independence in 1956. Chefchaouen’s medina is a delightfully picturesque maze of streets and derbs leading to the Outa el-Hammam square and the restored kasbah. The grand 15th century Tarik Ben Ziad mosque has an octagonal minaret which was inspired by the Torre de Oro in Seville. 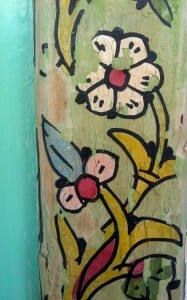 It is part of the Andalusian influence on architecture found in the kasbah and its gardens in the heart of the medina. 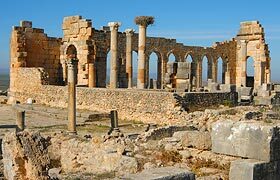 There is also a ruined Spanish replica of a mosque. 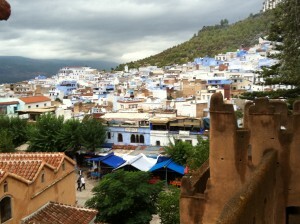 Chefchaouen’s main square in the medina is lined with cafes, craftsman, artists and weavers. 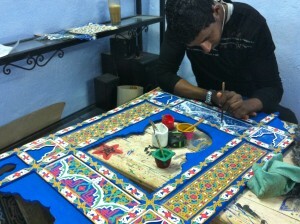 Tourists can also visit the Kasbah near Plaza Outa el Hammam and the museum in the medina. Chefchaouen’s Kasbah was built by the legendary ruler Moulay Ismail and is surrounded by gardens. Inside the Kasbah, there is also a museum containing antique weapons, musical instruments, berber artifacts and photographs of the old medina. 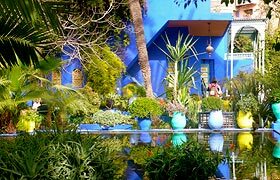 The town boasts a number of excellent restaurants as well as some many charming Moroccan Riads and boutique hotels. 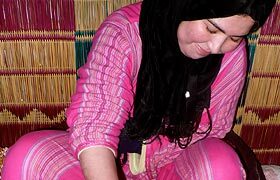 Morocco travelers can visit souks where they can find local products which are special to the region such as woven wool garments and blankets ,carpets, djellabahs, wooden furniture, pottery and artifacts . The area around Chefchaouen is a hashish and cannabis growing region as it is the only crop that can be grown in the mountainous region. 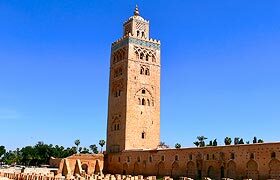 This may also partly account for the relaxed ambiance and you may well be offered some of the local product but smoking cannabis remains illegal, so tourists must avoid it as Moroccan laws are very strict and the penalties severe. The name “Chaouen” refers to the mountain which dominates the town and is said to resemble the horns of a goat. Climbing one of the surrounding mountains and trekking in the hills is a popular excursion. You can visit the Talassemtane Park and climb the region’s highest mountain Jebel Lakraa at 2,159 meters or visit the Bouhachem Park. For the adventurous there is the Kef Toghobeit Cave, nearly four kilometres long and over 700 metres deep, one of the deepest caves in Africa. There is also the Achkour cascade (waterfalls) and a natural bridge called locally “the Bridge of God” to visit. Chefchaouen is a delightful and relaxing excursion from Fes and also a great place to visit on a Morocco tour en route from Rabat to Fes. 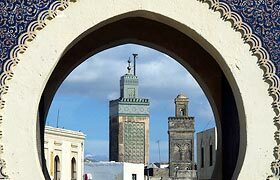 One of Morocco’s little known city sites where old world tradition and modern technology meet hand in hand is Casablanca’s Derb Ghallef. Derb Ghallef in Casablanca is worth visiting on a one-day Casablanca Tour. Derb Ghallef is essentially an enormous flea market and the center of distribution for black market goods and services in Casablanca, Morocco. The noise and bustle of the auction block, the bargain prices of the flea market and its goods are defining features of today’s Derb Ghallef. 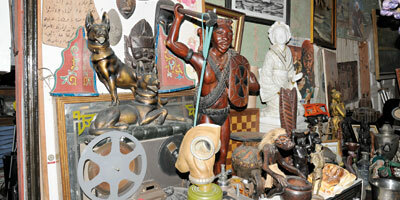 There is no better way to see a live flea market on a Casablanca Tour then Derb Ghallef. Casablanca’s Derb Ghallef is a world renown microcosm for how informal markets function in developing economies. 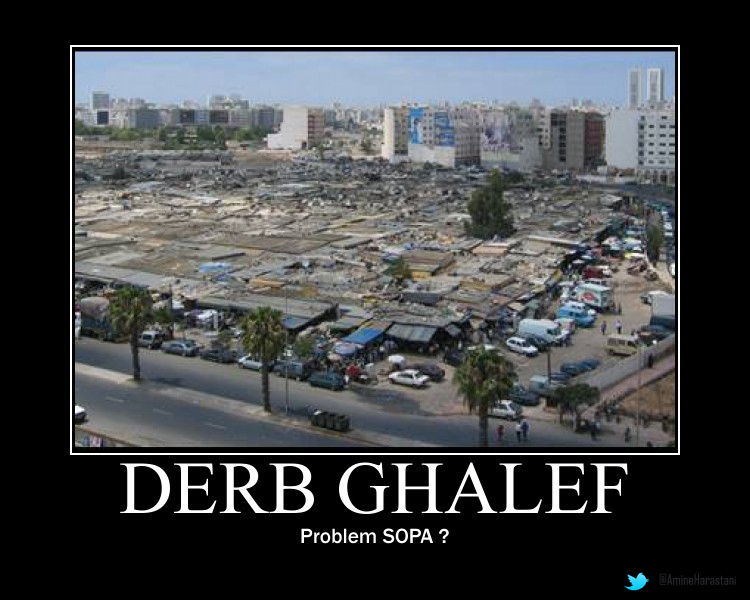 The Derb Ghallef has over 2,000 outlets that are located in narrow alleyway and looks like a shantytown. Most of the stores in Casablanca’s Derb Ghallef occupy not much more then 12 square meters, and are made of tin, zinc and wood. Casablanca’s Derb Ghallef even has a mosque with a its minaret made from green-painted cardboard and found materials. Derb Ghallef is not even o the electrical grid so to speak yet it generates over 140 million USA Dollars annually. The history behind Casablanca’s Derb Ghallef is nothing less then fascinating. Derb Ghallef began in the 1920’s as a shantytown near the center of Casablanca, as a result of rural migration and an increasing birth rate in the region. Subsequent to a welder accidentally burning down the area in the 1950’s, Casablanca’s Derb Ghallef resettled at a nearby site, where they created a flea-market and auction house for used goods. 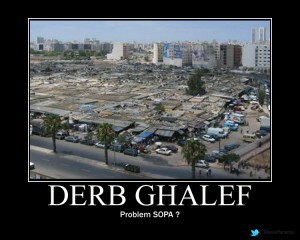 Derb Ghallef has no land rights and is not an authorized site of business. It has been a controversial place for decades that has breaded ground for corrupt officials to take advantage of the proceeds. The merchants of Derb Ghallef have created a nexus of commercial and technological innovation and a paradise of smuggled, pirated, and counterfeit goods. 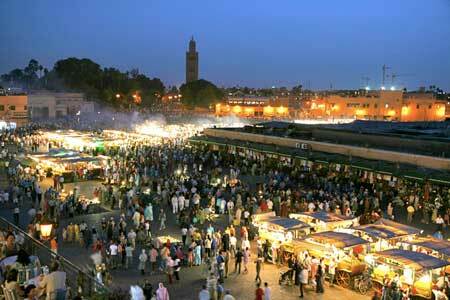 Marrakech is the Paris of Morocco and known as the “red city” or Al Hamra. 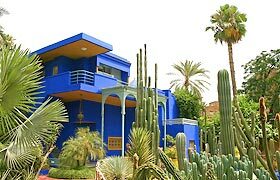 As the capital of tourism, Marrakech is Morocco’s leading Imperial city and one of the most exciting cities to travel to on vacation. 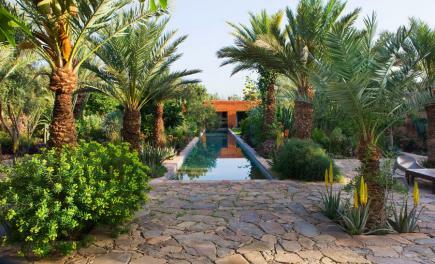 The heart of Marrakech is the best place to begin your tour with its souks, lush gardens, historical monuments, museums, palaces, sacred tombs and snake charmers. Marrakech also offers some of the best shopping in Morocco at its souks located within the old medina. As a Moroccan traveler a visit to Marrakech is a must. Make sure to allow yourself a minimum of two-days and spend at least one with a Morocco Travel licensed guide. 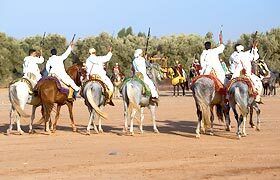 Travel Exploration Morocco’s Top 10 Sites to visit on Your Marrakech Vacation.